PISSARRO Exhibition Moves to Barcelona October 15! 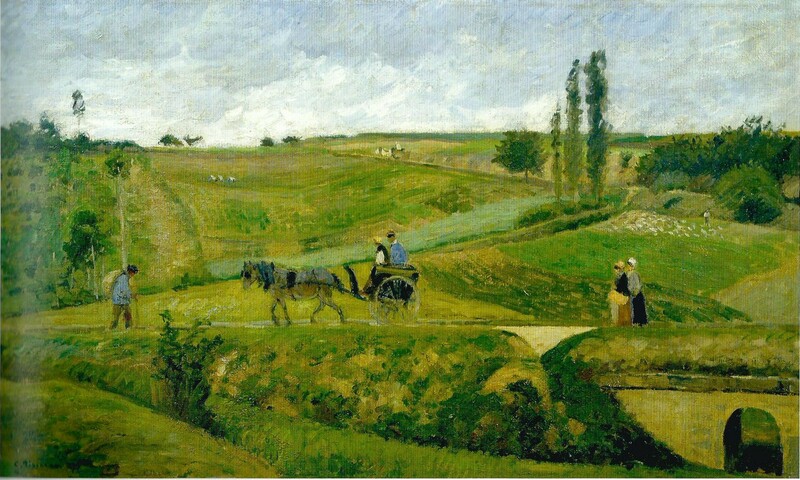 This charming landscape by Camille Pissarro was featured in the PISSARRO exhibition in Madrid. Perhaps it will also be included at the CaixaForum in Barcelona when the PISSARRO exhibition opens there on October 15. Some of Pissarro’s paintings look deceptively simple—and this is a perfect example! The top third of the canvas is filled with grayish clouds and the lower two-thirds are green fields. A horse and buggy provide a pleasant focal point just off center. So how do you explain the intrinsic sense of movement, steady as a pulse, that drives the action in the painting. It is only paint on canvas, but you really believe that the buggy is moving forward at a brisk clip. You know that the man on the left will meet the two women walking towards him, and that the tiny buggy on the hillside road will soon disappear from sight. Underlying these believable elements is a dramatic geometric form—a large lazy Z figure that appears on the horizon just left of center (look for the tiny buggy), makes a sharp angle around the three tall poplar trees, and almost disappears at the left foreground before it forms the bottom of the letter leading to the two women. In a landscape that appears soft and curvy, this large Z is decidedly sharp and angular, dividing the fields into separate sections. As if to heighten the excitement, Pissarro works each section in a different manner. Look closely at the space beneath the main road in the foreground. It is divided into four sections of grass, each of them different shades of green, and a small yellowish bridge. The section between the bottom of the Z and the strong diagonal from left to right includes six or seven different sections with small dark green trees at the top right edge of the canvas. The section between the top of the Z and the diagonal is mostly a rosy beige with patches of green but is bordered on the left by darker green. A mysterious pale green band leads our eyes to the three tall poplars at the angle. The distant space above the second road going up the hill appears to be rocky fields defined by a narrow line of tiny green trees on the horizon. Even the sky seems to be doing its part, with the dark clouds scudding away quickly leaving lighter, brighter skies near the horizon. All the movement is grounded by the prominent arch of the small bridge in the right lower corner of the canvas. It is reflected in the rocks just to the left highlighted by the small white arrow formed by the road’s surface. The stability of the view is also anchored by the presence of a herd of sheep with their shepherd far in the distance just above the woman’s white cap. Pissarro’s paintings are often subtle. They don’t scream at you with clashing colors and jagged edges, but a careful look reveals many intricate features and very often surprises. will be available in Barcelona at the CaixaForum bookstore.